At the continent of Tellius, a land blessed by the Goddess, there exist two races: The Beorc, whose appearance is close to the gods and the Laguz, whose appearance is inbetween the gods and the beasts. These two races co-exist and, after many warring and disputes, are now separated into seven nations. One of these is the Kingdom of Crimea, home to Ike of the Greil’s Mercenaries. Ike has been training every day for the challenges that are about to await him. Although the continent is peaceful, things are slowly changing and the continent is set to face a great disturbance that will shake the lands. After three consecutive games on the GameBoy Advance, it was probably time for a change. Path of Radiance was Fire Emblem‘s debut on the GameCube, and its first console outing since Thracia 776 on the Super Famicom. In fact, some gameplay elements last seen in Thracia 776, such as the Skills system, made a welcome return. For the first time in the series, the game contains fully-3D battle maps and battle animations. The game was also released on the year of Fire Emblem‘s 15th anniversary. Path of Radiance begins a new story, set in the continent of Tellius. The sudden invasion of Crimea, by the militant Kingdom of Daein, prompts Ike and the Greil’s mercenaries to survey the situation at Crimea. There they discover Elincia, the secret Princess of Crimea, and decide to accompany her to Crimea’s suzerain state, the Begnion Empire, to seek help. Path of Radiance is a metaphor for Ike’s journey, as he encounters tales of racism, corruption and genocide, but also tales of love, forgiveness and hope. New gameplay advances include a new shape-shifting race called the Laguz, weapon forging and a base of operations. Like in The Sacred Stones, three distinct difficulty settings are available from the start, including Maniac mode (in the Japanese version only), which almost rivals Thracia 776 in difficulty. CG (computer generated) movies appear occasionally to flesh out the story. Also the in-game tutorial is much improved, and can be accessed at any time. Once you reach a certain point in the game, the Base will be available to use before every battle. Similar to the Castle in Genealogy of the Holy War, at the Base you can manage your characters, items, Skills and Supports. You can also view special Info conversations, which are optional, but include more detailed storyline background and may yield rare items or new recruits. 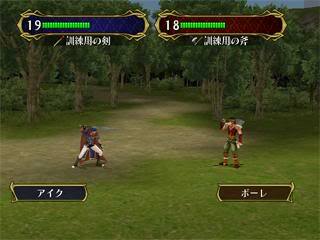 Ike trains against Boyd, a fellow mercenary. Or Bonus EXP for short. These are out-of-battle experience points, earned by fulfilling certain criteria during battles. Bonus EXP can be distributed to characters of your choice, back at the Base, which is a great way for building up weaker characters, who have a tough time fighting early on. An additional element of randomness. Each character has a Biorhythm chart, which is related to how good they are physically feeling. The position on the chart, whether high, low or neutral, slowly changes as the game progresses and the position slightly alters the accuracy and avoid stats of characters. These work almost identically to the Skills in Genealogy of the Holy War and Thracia 776. Certain characters have special Skills, which affect a variety of things and may offer an advantage in battle. For example, Soren’s Adept has a random chance of allowing him to perform a two-hit strike attack. However Skills now cost Capacity, which characters have varying levels of. So, unlike before, one character can only have a limited number of Skills. Promoted characters can also learn a Mastery (or Occult) Skill by using a rare Occult scroll. These Skills are usually the most powerful of them all. The Laguz are a half-human and half-animal race. 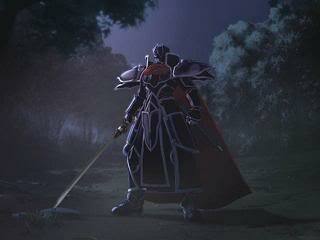 Laguz cannot fight in humanoid form, but as battles progress their Transformation gauge slowly builds up. Once the gauge reaches its maximum level, the Laguz will transform into animal form, where its stats are greatly increased and it can attack. The gauge will then start decreasing and, upon reaching zero, the Laguz will revert back into humanoid form and the cycle repeats. Different animal types feature, including cats, birds and dragons, each with their own distinct characteristics. An in-depth tutorial can be accessed at almost every point in the game, from the in-game map menu. In Easy mode, the tutorial is often referred to, but it is never forced at the player, unlike in Blazing Sword. Anna, the mascot of the series, appears to host the tutorial. Every area of gameplay can be consulted and visual guides are given in all cases. The Strength stat of characters now has a dual use. Previously Build or Constitution was used to determine the speed loss from using heavy weapons, but Strength now takes that role. Since the Strength and Magic stats have been split once again, this also gives a reason for Mages to have Strength. A new weapon type has been added, which are Knives. Knives are like shorter swords, but equipped primarily by Thieves. They also exist outside the Weapon Triangle. Anima magic has been seperated into Fire, Thunder and Wind magic once again, with the Magic Trinity from Genealogy of the Holy War being in effect. However this time Dark magic is absent and Light magic exists outside the Magic Trinity. Magic-based weapons have also been added for Lances and Axes to complement the Magic-based Swords, such as the Runesword. At the base, certain weapons, such as Iron Sword, can be forged to slightly alter their stats and change their colour. Forged weapons can also be given a name by the player. Weapons can only be forged once per chapter however. During certain major events, CG movies are shown to enhance the story. These movies have an impressive cel-shaded style and are fully voice-acted. A difficulty setting that appeared in the Japanese version, which is of higher difficulty than Hard mode. This was a worthy challenge for experienced players that further reduced the obtainable Bonus EXP, increased enemy attributes and enemy count.